We, civic and human rights organizations of Egypt, Jordan, Lebanon and Palestine, in mobilization for Palestinian Prisoners’ Day this year, call for the boycott of the G4S company in the Arab World because of its involvement in Israeli occupation and oppression. G4S is a multinational company providing private security services. 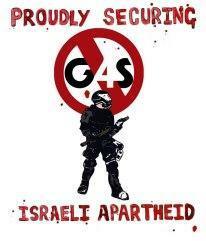 Among its services, G4S, through its Israeli subsidiary, Hashmira, provides equipment for Israeli occupation checkpoints and for settlements in the West Bank. G4S provided equipment for Ofer prison, located in the occupied West Bank, including defense and command and control equipment. G4S equally provided the Gilmeh interrogation centre with security systems. And they have provided equipment and services for the West Bank Israeli Police headquarters and Israeli interrogation centers, known for their practice of torture and ill-treatment of detainees. - The European Union to abandon G4S in the management of its facilities, namely in its diplomatic missions in the Arab World. We remind the European Union that the European Parliament decided not renewed its contract for security services with G4S due to its work and complicity with Israeli prisons and its work in the settlements. Time is long overdue to break this chain of international business complicity in Israeli violation of international law, such as that of G4S.